GENOA -- The crude oil spill from oil company IPLOM’s pipeline in Liguria is putting fragile ecosystems in the firing line, causing the death of thousands of fish and putting many birds, which live in nearby streams and the sea, at risk. 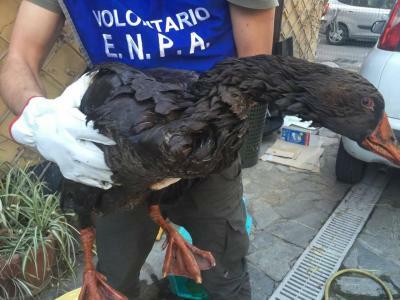 The alarm has been raised by the head of the Italian bird protection league LIPU in Genoa, Daniela Filippi, who just on Tuesday singlehandedly saved 27 mallards who had been completely covered in the oil and were unable to fly. “Thirteen of them are doing alright now, the others however are in a more serious condition as they breathed in the crude oil fumes,” reported Filippi. A mallard that was reported to be covered in oil as it arrived at the port in Messina has confirmed fears that the spill has reached the sea in the space between the piers and will enter the port at Genoa. Fish were reported dead at the mouth of river, where they enter the sea. 680 thousand litres of crude oil poured out into the streams of Pianego, Rio Fegino and into the Polcevera river on Sunday evening, only one month before the pipeline was due to be checked again. Residents around the rivers are reporting the deaths of many frogs in the area. As strong winds push the spill from the riverbanks and into the seaport of Genoa, the IPLOM clear-up operation is well underway, after an emergency environmental meeting was called in Genoa on Wednesday morning. The national animal protection association in Genoa, ENPA, has rescued dozens of species of ducks, herons, geese, and mallards. They have also set up an emergency hotline for residents to report animal in need: 010.5531696. Once they have been saved from the water where they can barely move for being smothered in oil and intoxicated by the fumes, they are taken to a location where volunteers are treating them; first with vegetable oil to remove the crude oil, and then with a neutral detergent to remove contaminating agents. “Then there’s nothing left but to cross our fingers and hope that the level of intoxication is not fatal,” explains Massimo Pigoni, the head of Animal Protection in Genoa and national vice-president of ENPA.